Combining precious metal clay and fused glass cabochons to make a pmc jewelry piece is not hard to do. Choose the size of the cabochon you want to use, either make it yourself in your glass kiln or you can purchase one from an online store. Fused dichroic cabs are excellent when set in pmc silver, or you can use fused art glass cabochons as per the photo. Follow these simple directions and you should be able to produce a nicely finished jewelry piece. Roll out a piece of clay making sure that it is thick enough to support the glass you are using. Texture the piece of clay if you wish, place the cabochon onto the clay and press gently so that a slight impression is left on the wet clay. Use an exacto knife or a shape cutter to cut and remove a portion of the clay for the glass to sit in. I like to use a small heart or star cutter as this gives a nice look on the back of the piece. After you do the cut out take a small piece of clay and roll out a snake with your fingers. Place the cabochon onto the backing piece and brush the clay around the cabochon with slip. Place the rolled clay around the glass making sure that it is not tight as the clay will shrink when fired and will form a neat fit. If it is too tight the glass may crack or the clay will crack also. It is very important to do as much finishing as you can before the piece is fired so take out your various grades of sandpaper and refine the piece once it has dried to a leather finish. Once you are happy with the piece then follow the firing instructions included with the clay. It is most important to let the piece cool in the kiln naturally with the kiln door closed. This will allow the glass to anneal and all internal stresses will be released. If the glass isn’t annealed properly it may crack at a later date. The above photo shows a simple means of using a triangular art glass cab, which has strips of metal clay front, and back holding the glass. A small tube has been added to act as a bail for a chain. 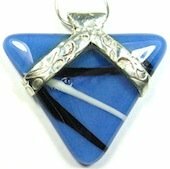 Visit Silver Jewelry Clay at Delphi Glass for a large range of tools and supplies for making PMC jewelry. Delphi carries a large range of glass fusing items as well as dichroic glass.